Kimlun Group is involved in 3 segments, namely Construction, Concrete Products Manufacturing & Property Development. 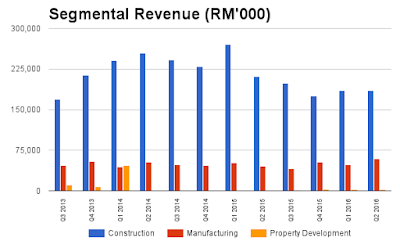 Most of the earnings are derived from Construction & Concrete Products Manufacturing. In 1H2016, Construction and Concrete Product Manufacturing accounted for 51.6% and 47% of operating profit respectively. Property division contribution was insignificant. Profitability surged to all-time high: Highest quarterly earnings of RM24.1mil, helped by significant increase in net margin, which rose to 9.8% from 7.3% in 1Q2016 and 6% in 2Q2015. ROE improved to 20% in 2Q2016 (annualized basis) from 14.3% in 1Q2016 and 14.9% in 2Q2015. The higher margins achieved were boosted by economies of scale from higher volume of manufacturing and trading operations. 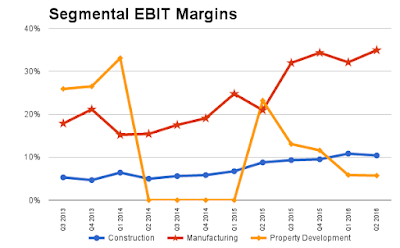 Construction margins improved as well from higher-margin projects and lower raw material and fuel prices. Over the past few years, its margin improvement was nothing short of impressive, with construction and manufacturing EBIT margin doubling from 5% and 18% in 3Q 2013 to 10% and 35% respectively in the most recent quarter. Dividend reinvestments: Recent dividend reinvestment plan (DRP) showed confidence of management towards the Company’s prospects. In total, directors have increased their holdings by 5.56mil shares from DRP. 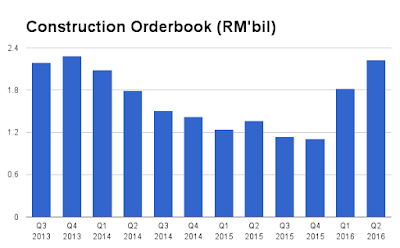 Sizeable orderbook to provide visibility: The Company has more than RM1.9bil worth of outstanding construction orderbook that could last till end 2018 coupled with RM0.3bil worth of manufacturing works, providing clear visibility in the next two years. MRT Projects: KVMRT Line 2 (KVMRT2) with a total length of about 52.2 km, the Light Rail Transit Line 3 (“LRT3”) and the Malaysia-Singapore High Speed Rail - Kimlun’s subsidiary, SPC Industries Sdn Bhd (“SPC”), has completed the sales orders for the supply of SBG and tunnel lining segments (“TLS”) to the on-going KVMRT1 in 2015. With the strong track record in supplying SBG and TLS to KVMRT1, as well as to Singapore MRT projects, SPC is well positioned to compete for further potential SBG and TLS sales orders from these rail projects. Pan Borneo HIghway - ZKCSB (30% owned by Kimlun) was awarded with a work package under the PBH for a contract sum of RM1.46 billion (“Project”). The estimated completion period of the Project is end March 2020. Affordable houses and public amenities such as hospitals and clinics. The Board believes that most of these projects will be constructed using IBS construction method having regards to the Malaysian Government’s policy that the content of IBS components in every new government project is to be increased to no less than 70% with effect from 31 October 2008, save for certain exceptions. Being one of the few contractors with IBS design capabilities backed by pre-cast concrete manufacturing plant, the Group is in the position to take advantage on the roll out of these projects. Singapore sewerage projects: SPC has been a frequent supplier of jacking pipes to various sewerage projects in Singapore. reaffirms that the Government will provide support to construct essential infrastructure such as roads, drainage, and utilities for RAPID development. 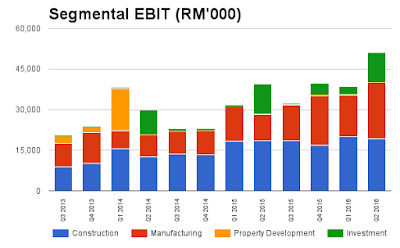 Cheap valuation: Kimlun is a purer construction player with little property development contribution, unlike its peers such as Gadang, Mitrajaya, HSL, WCT etc which have substantial property development operation. Mitrajaya, HSL, WCT and Kerjaya are all trading at PER of 10-13x. Thus, I believe Kimlun’s valuation should be trading close to average construction PER of above 10x as opposed to property developers’ PER of 6-7x (Tambun, Huayang, Matrix etc). Assuming its orderbook of RM2.2bil to be completed over the next two years and net margin of 8%, annual revenue and net profit could reach RM1.1bil and RM88mil respectively. By ascribing a PER of 10x to its net profit of RM80mil, market cap should be RM800mil, translating into target price of RM2.60. I’m a shareholder of this Company. Time your own entry and exit. All the best!